But he was doing ok. Last week I've come to find that bonnie went in to his hang out cave and stole his shell held onto it for some time then took it over leaving him naked and stressed and Leaving clyde traumatized he dropped all legs except one long walking leg and his big messed up pincer from original fight . I know it's not a sure thing but as long as hes not giving up neither will I. Pictures posted as well thank you. Last edited by StarGirlxo on Tue May 01, 2018 10:16 am, edited 1 time in total. I’m really sorry to hear what has happened to your poor crabbie. 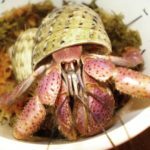 I have had past experience with shell fights - one of my molters came up and one of my other crabs took the opportunity to steal his shell which left him naked and traumatised. I isolated him and offered him food and water, but he kept dropping legs until he had 1 leg and 1 claw left and unfortunately after about 5 days, he passed away. From my experience, the chances of survival aren’t great if they have been severely stressed, but my advice is to just keep doing what you’re doing, and monitor him closely to make sure he is doing alright and starting to eat and regain his strength again. 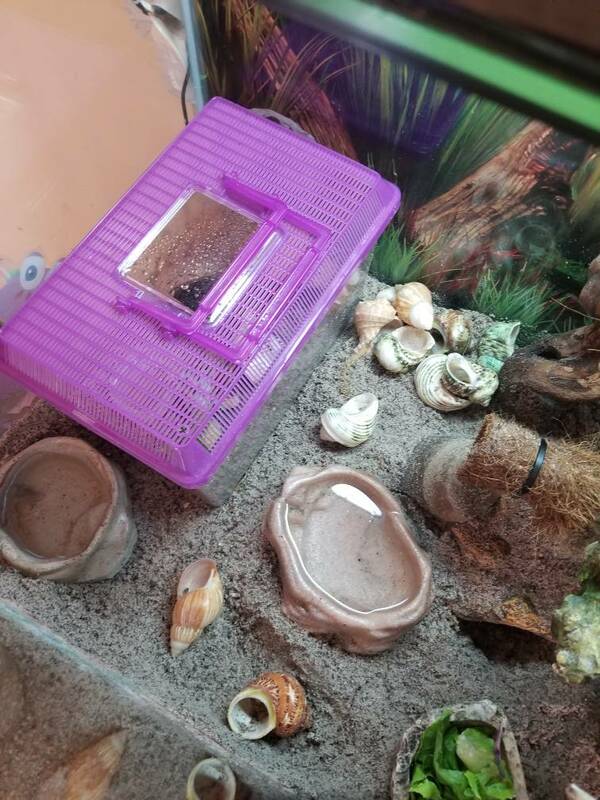 Probably best to keep him isolated for a while until he starts looking like he’s going to molt again. Angel_crab wrote: I’m really sorry to hear what has happened to your poor crabbie. We are here for you if you need us! Try not to handle him! Make sure he can eat a LOT - I like honey, insects, shrimp and coconut for these situations - give him access to water at least daily (I did three times a day, first salt than fresh, it also allowed for some exercise and kept her clean), and he should grow in gel legs in a month or so and then molt and grow new legs and pinchers soon! wodesorel wrote: Make sure he can eat a LOT - I like honey, insects, shrimp and coconut for these situations - give him access to water at least daily (I did three times a day, first salt than fresh, it also allowed for some exercise and kept her clean), and he should grow in gel legs in a month or so and then molt and grow new legs and pinchers soon! Awe...those pictures melted my heart!!! I would leave her in for 5 or 10 minutes and walk out of the room to do something else. She was really jumpy around me though so I couldn't watch her! And just like a 1/8 to a 1/4 inch of water, just enough for her to dip mouthparts and scoot around the cup, not enough to spill into her shell opening. wodesorel wrote: I would leave her in for 5 or 10 minutes and walk out of the room to do something else. She was really jumpy around me though so I couldn't watch her! 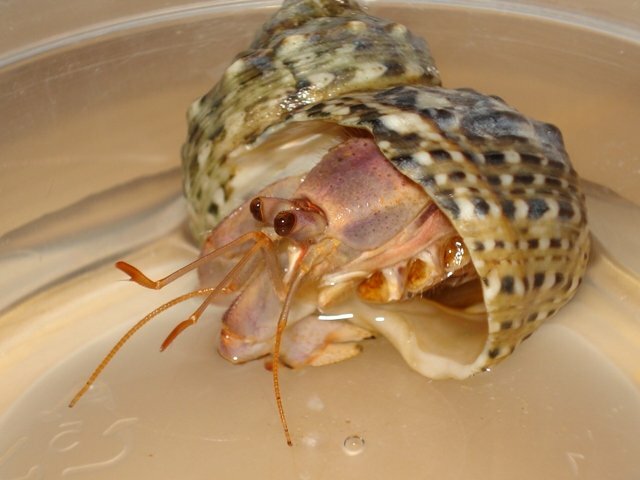 And just like a 1/8 to a 1/4 inch of water, just enough for her to dip mouthparts and scoot around the cup, not enough to spill into her shell opening. Keeping you updated. Now that I'm sure of what to do. He just got watered (no pics ) I will later. I found the qtips to work better than dishes in her case, as the only moving parts that could lift were her mouth. For powders I would roll it in honey or babyfood first, then roll it in the dry like sprinkles. Always kept proteins, honey and coconut as those allow for a lot of energy and calories and good fats which is the fastest way for them to build up molting reserves! wodesorel wrote: I found the qtips to work better than dishes in her case, as the only moving parts that could lift were her mouth. For powders I would roll it in honey or babyfood first, then roll it in the dry like sprinkles. Always kept proteins, honey and coconut as those allow for a lot of energy and calories and good fats which is the fastest way for them to build up molting reserves!